Native to Australia and New Zealand, Eleocharis grows in marshes with various water levels. The maximum height is noticeably shorter than Eleocharis acicularis, typically only a few centimeters (less than two inches) tall. Another exceptional feature of this hairgrass is that the stalks are bright green and slightly curved. Eleocharis pusilla does best in cooler water; it cannot endure relentless high temperatures over 77° F. This delicate dwarf spikerush is particularly well-matched to stone setups in the Iwagumi fashion, for the creation of a fresh "summer meadow". Like Echidonorus acicularis, Eleocharis pusilla can also be cut well back, which makes the grass even denser and more compact. 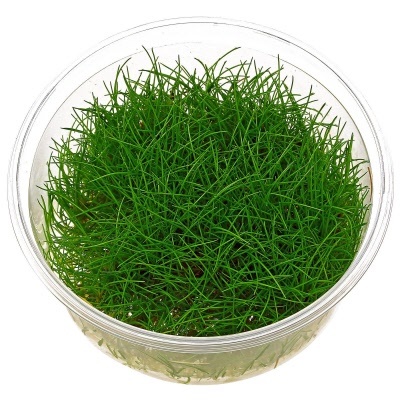 InVitro plantlets are submersed in 100 percent humidity. Many aquarium plants are sold immersed, which means the foliage is grown above the water. These plants die back after they are planted inside an aquascape, and they regrow with the new leaves looking different than they did when they were purchased. With In Vitro submersed specimens, you get stable, nonstop growth.